"The course appealed to me in the first place because it gave a lot more than just floristry – it was quite detailed." 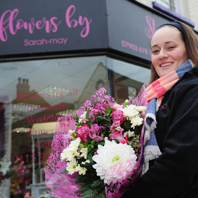 Sarah-May Anderson’s Saturday job in a fruit and veg shop sowed the seeds of an idea which led to her own floristry shop. And while the bunches on sale at her part-time work first fired her imagination, it was the broad spectrum of Derby College’s full time Level 3 Floristry course which inspired her to enrol. She said: “The course appealed to me in the first place because it gave a lot more than just floristry – it was quite detailed.